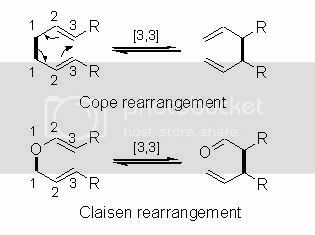 Large substituents similar to their behavior in chair conformations of cyclohexane rings prefer an equatorial configuration in the transition state of [3,3] sigmatropic reactions. Heating S,S-3,4-dimethyl-1,5-hexadiene to approximately 200°C yields in 90% a product derived from a chair transition state with equatorial methyl groups. The product arising from a diaxial conformation is formed in only 10% yield. Obviously, the reaction does not proceed through the boat transition state.